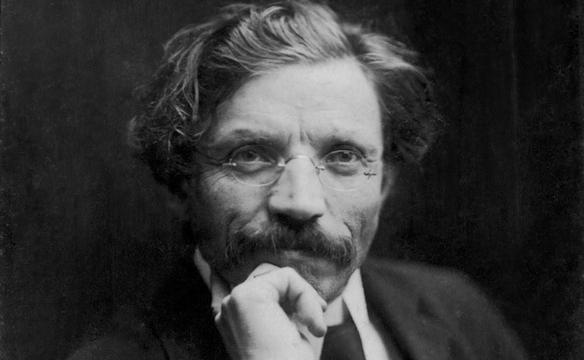 Sholem Aleichem was instrumental in making Yiddish the language of literature in the area of Eastern Europe known as the Pale of Settlement. Born Solomon Rabinowitz to a well-to-do family, Aleichem was the product of the Haskala, or Jewish Enlightenment, and in the years preceding the pogroms, Aleichem’s father, who would eventually lose his fortune (a traumatic event that is echoed in Tevye’s famous “If I Were a Rich Man”), had actually attempted to give his son a secular education at a time when such a thing was a distinct anomaly. Aleichem’s later turn to Yiddish, a product of Jewish culture, was in this regard a blow to his father. Aleichem’s vehicle was humor and the creation of his persona, with the name Sholem, was an effort to bend his ear to humanity. But it also derived from his realization of the power of journalism as a medium that would bring the Yiddishkeit to the masses. Joseph Dorman’s film, Sholem Aleichem: Laughing in the Darkness, makes all these points, with the help of vintage clips and commentary from famous Yiddish scholars like Daniel Miron of Columbia University, Ruth Wisse of Harvard and Hillel Halkin, among others. Bel Kaufman, author of the classic Up the Down Staircase and Aleichem’s granddaughter, also has a cameo in the film. The conflicts that overshadowed Sholem Aleichem’s career, which vacillated between secular and non-secular order (Enlightenment universalism versus an emphasis on Jewish identity), would later be mirrored in the split between intellectual contemporaries like Walter Benjamin and Gershom Scholem over Marxism versus Zionism. “Tradition” is another famous refrain of Tevye’s, and Dorman’s film dramatically points to the conflict that the Diaspora would create. Who would ever have thought that America, the country that was most hospitable to Jews, would be most responsible for destroying their culture? Any best essays happen to be those which really don't give in into the demands for hiring people to put in writing doctored critical reviews with regards to the webpage. I want that your place hammered out the condition regarding getting certain actual critical reviews. I have previously been pursuing the spots avidly. From their website, We have found in which writings creating true isn't thus stubborn. My husband moreover i experimented accompanying my admit palm accompanying writings enhancing plus plus identified distinct guidance about my have essays enhancing about essayontime. This point proved so beneficial that I am forthwith a smug composition editor. .